‘Appel à tous. Ceci est notre dernier cri avant notre silence éternel.” The English translation, not quite as poetic as the French, reads, “Calling all, this is our final cry before our eternal silence.” This was the last ever transmission of Morse Code, by the French Navy on 31 January 1997 (so recent!). The dead language and its dying call have risen again, the distress signal now fodder for artist Angelica Mesiti, long interested in capturing on video the songs and sounds of different cultures. If communication beyond words is the theme of Mesiti’s career, in Relay League she takes the idea of translation and makes it lateral: the French Morse Code is translated into English, then into a sculpture of giant dots and dashes hanging like a mobile, then into percussion, then into dance, then taught by touch to a vision-impaired dancer. Though the “final cry” might summon a picture of dark waves like shifting mountains, Mesiti has chosen an urban setting for her three-channel video work. On the first screen we encounter a drummer. Mesiti asked musician-composer Uriel Barthélémi to create a percussion score from the last SOS. It’s a fluid creation with a free beat: cymbals are struck on a bass drum, feathered brushes evoke the dashes, flashes of silence create their own dots, and at moments, a more distinct phrase rises out of tiny abstract pulses. Mesiti captures all of this with close shots at first, gradually moving toward a wide shot of Barthélémi on a Parisian rooftop. The second screen, approached around semi-transparent, curvilinear white paper walls, also starts with close-ups: hands, grasping. Two people sit beside one another, captured in a shallow depth of field that accentuates the tactile nature of what they’re doing: a woman is teaching a sight-impaired man a dance routine by way of touch, guiding him through the movements and tracing her fingertips across his wrists. They have an intimate spoken shorthand, too, with occasional murmurs in some undetermined language. They’re watching something, and though we can’t see what that something is, we can hear Barthélémi’s score in the background, simmering and pulsing away. It’s the final screen that brings everything together. We realise the couple is in a light-filled studio watching and learning from a dancer, Felipe Lourenço, who has animated Barthélémi’s percussion with his own stuttering choreography of loose gestures—punches, straightened arms, splayed fingers, swinging torso and pattering steps—that made me think of dance as a kind of annotation. Like the first two screens, this one is dominated by a soft blue colour palette, the dancer’s skin providing a warm counterpoint. With its huge crew (a producer, cinematographer, sound designer, post-production coordinators, camera operators, sound recordists), Relay League is fascinating for what it says about the present state of video art and how it’s changing in the digital era. 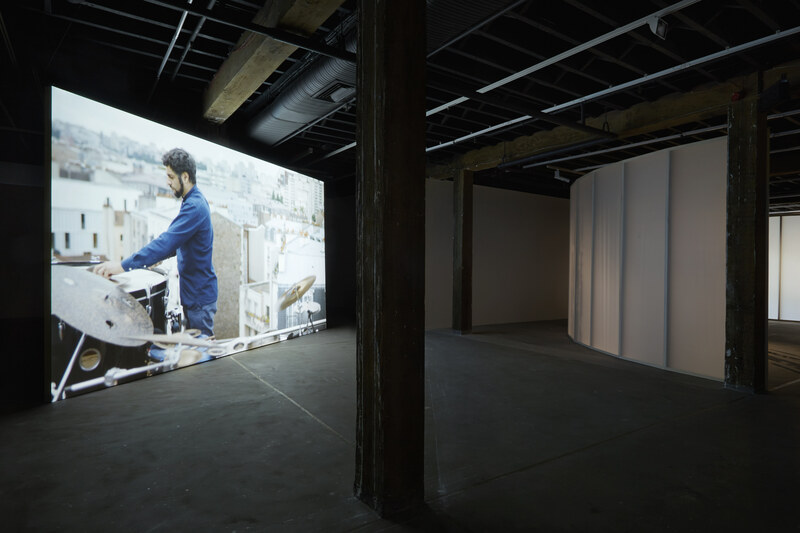 The discipline began with incredibly lo-fi analogue creations displayed on TV monitors in the 1960s; now works like those of Mesiti, Lynette Wallworth and Hossein Valamanesh are created at a kind of high-definition super-video junction between the art and film industries. The art sector is so industrialised and professionalised that video artists are more akin to creators of short films, with production companies (which often also produce feature films, eg Sydney’s Felix Media, a frequent Mesiti collaborator) in some ways acting as co-creators. Andy Warhol’s Factory is everywhere. While artists like Soda_Jerk will, you suspect, forever lurk in the low-tech world of sampled videos and darkened bedroom edit suites, Angelica Mesiti seems increasingly to be at the forefront of this wave of glossy, highly-produced video work. This is not a criticism. Aided by the support of half a dozen organisations, the new work retains Mesiti’s artistic DNA. And while Shaun Gladwell, perhaps the most commercially successful video artist in this country, has been the subject of much of his own work, I find it more interesting that Mesiti casts her eye over the identities and cultures of others. A new quality evident in Relay League, compared with her past works, is that it induces a kind of synesthesia: aural and visual components begin to bleed together, gridded apartment windows become dashes of Morse Code, chimneys become the dots, your eyes become your ears. 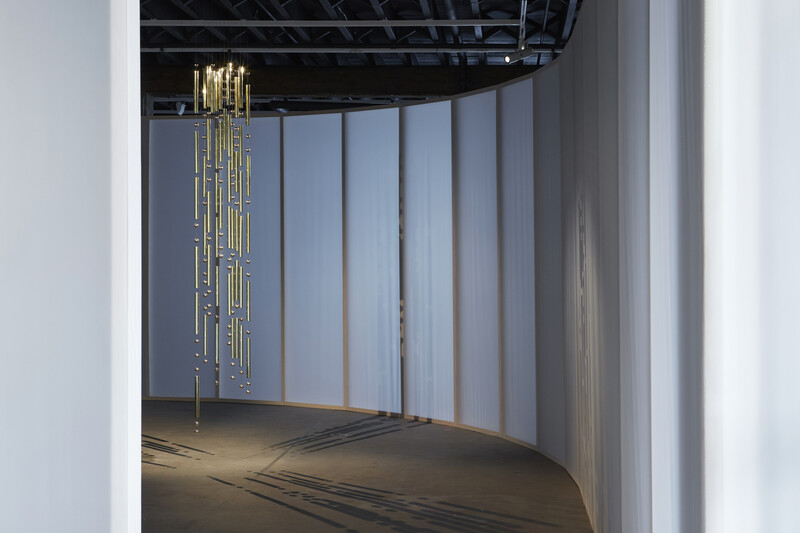 Like her 2012 work Citizen’s Band, the videos are embedded in a thoughtful installation: in Relay League, you can hear the three channels’ audio echoing each other throughout Artspace—they are arranged as three links in a chain. I like the idea that through video, Mesiti is finding new ways to encompass other disciplines, like dance and music, while retaining what’s unique about video art. From the death knell of Morse Code, Angelica Mesiti has found a new point of departure for collaborative artmaking, for different forms brought together as one. Relay League, writer, director, editor Angelica Mesiti, performers Uriel Barthélémi, Sindri Runudde, Emilia Wibron Vesterlund, Felipe Lourenço, producer Anne Becker/PLATÔ, cinematographer Pierre Jouvion, sound design, mix Liam Egan, curators Alexie Glass-Kantor, Michelle Newton; an Artspace commission; Artspace, Sydney, 4 May-9 July; touring nationally.